Amidst all the great pulp thrills and features in Sky Fighters, they ran a true story feature collected by Ace Williams wherein famous War Aces would tell actual true accounts of thrilling moments in their fighting lives! This time we have French Flyer Captain Charles Nungesser’s most thrilling sky fight! Of all the great French Aces, none is more poignantly remembered than Charles Nungesser, who began his flaming war career as a Lieutenant of Hussars and was one of that famous lighting band of cavalrymen that stopped the German Uhlans at the gates of Paris. 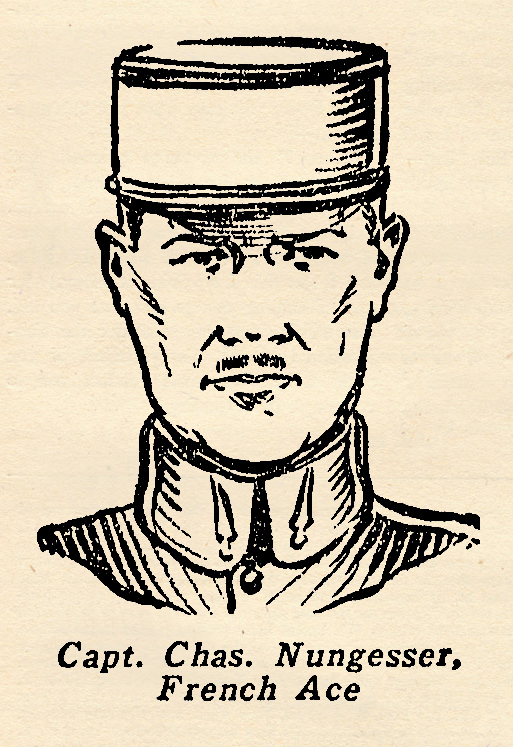 For his exploits in this heroic stand he was awarded the Medal Militaire, the highest combat award. But horses were too slow for this daring, dashing young officer. He transferred to aviation and was trained as a bombardment pilot, after which he took part in thirty-eight bombing raids across the German lines, before his unusual flying ability was recognized and he was sent on to a chasse squadron—Nieuport 65. Nungesser was wounded seventeen different times, but in between times in the hospital managed to run up a score of forty-one victories and was awarded every decoration possible. Ten years after the war’s end, Nungesser, with a colleague, Major Coli, took off from Paris on an attempted non-stop flight to New York. His plane disappeared into the blue and no trace of either Nungesser, his colleague, or the wreckage of the plane has ever been found. Thus ended the flaming career of one of the greatest of all sky fighters. His own story of a thrilling battle as recorded by a French journalist, follows. ALL duels du ciel are thrilling—some in one way, others in another. It is thrilling to down an enemy after pouring burst after burst into his avion. Many times I have done that, but I think it is even more thrilling, more exciting, and certainly more unique when one downs an enemy avion without firing a single shot. I have done that—in fact, I didn’t even have guns on my avion, let alone bullets. I shall tell you about that. The motor of my avion had been acting up. The mechanic came to me when he had repaired it, and I said I would take it off for a test flight. I did, went way up into the blue above the clouds to 5,000 meters. The motor was splendid. I sailed around absent-mindedly enjoying the beautiful view, when lo and behold, a Boche avion breaks into the clear space beneath me. It is a two-seater, less than thousand meters away. I dip and go for him, but he sees me before I reach firing range. The gunner in back stands up and swings his mitrailleuse on me. Tack-tack! He puffs a short burst. I slip under it and dive faster, my own fingers poised on the trigger trip—ready to give it to him when I get closer. I get closer, close enough! The Boche is clear in my sight. I press the trigger— but nothing happens! Another burst from the Boche gunner flicks through my wings. My own gun is jammed, I think. I reach up to clear it, still holding on the Boche’s tail. But Mon Dieu—I have no gun! The cradle is empty! I am almost about to crash the other’s tail now. He has to dive to get away. I see the rear gunner standing up in his seat. He is fumbling with his gun. It has jammed. Terror is on his face. The Boche pilot dives and zig-zags to get out of my range. I keep pressing close on top, pushing him down in a long steep spiral. The rear gunner gives up, folds his hands complacently and waits for my bursts to snuff his life out. Down and down we spiral, through the clouds, out underneath. The gunner fumbles at his mitrailleuse again, I decide to run my bluff, hoping that I can force them to land before the gunner clears. Voila! I do. The Boche pilot spies a clear space and sets down. I circle and land beside them, but I am helpless when they set fire to their machine. I have no guns to prevent it. Poilus surrounded the burning avion and took the two Boches prisoners. Both were very mad and swore profanely when they found out I had no guns on my avion. But it was another victory for me, the most unusual one! The armorer had removed my gun to clean, when my avion was laid up for repairs. I had neglected to see that it was in place before I took off.